We sell chickens separately if you have your own coop. At Rentachook we sell a hybrid hen called an ISA Brown. 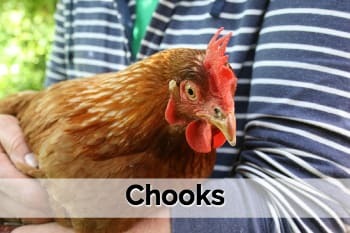 These are renowned for their egg laying (they hold the world record for the most eggs laid by a chook in a year!) and they are placid (get along well with kids and other pets). All birds are sold at ‘point of lay’ or just laying, usually between 16 and 20 weeks old. The chooks have been triple vaccinated and cost $40 per hen. Please note that to ensure health and wellbeing of hens I do not keep them in stock and I get them from the farm to fill orders (usually once a fortnight). Hens need to be picked up from me in Ryde or delivered by us as I will not send live animals by courier. Please bring a cardboard box (wine box size for a couple of hes is sufficient) or a cat carrier if you have one. There are occasions when chooks are out of stock because I am fussy about the hens I buy. I won’t buy hens from suppliers that have previously sold me unhealthy hens and I won’t buy hens that have been de-beaked. If this means I lose you order, it is a price I am willing to pay to ensure I’m happy with the chooks I sell.